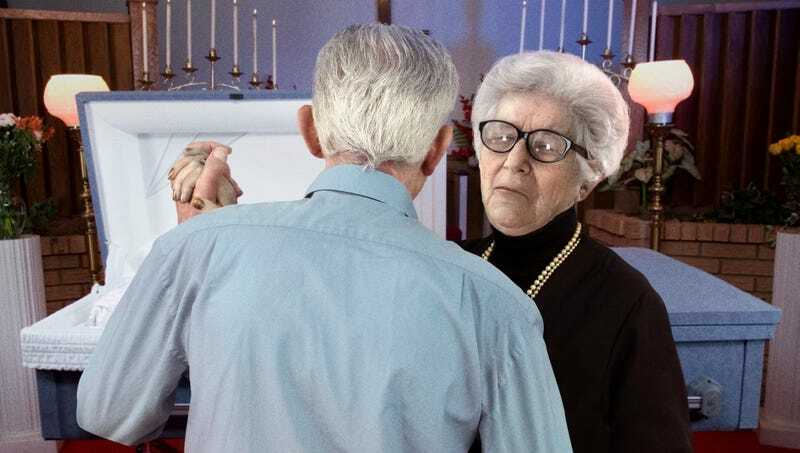 FRANKLIN, TN—Wiping away bittersweet tears as the lights dimmed and the lovely couple took the floor for the first time as widower and wife, attendees at the funeral of Martha Bowers got misty-eyed Thursday during the traditional first dance with the corpse. “You could just see the love in [Phillip Bowers’] eyes when he took her flaccid hand in his and guided her carefully to the dance floor, and everyone was amazed at how beautiful she looked in her burial dress,” said longtime family friend Clara Adler, tearing up along with the couple’s other friends and loved ones as the opening strains of Etta James’ “At Last” filled the funeral parlor. “Just seeing her out there, swaying along with him, draped over his shoulder for the first time in this new stage of their, you know, their lives...it’s so touching. You can see tears glistening in his eyes. This is the moment when he knows—it’s forever.” At press time, the funeral attendees had taken the floor and joined a conga line led by Mrs. Bower’s earthly remains.